ITEMS IN THIS POST ARE NO LONGER AVAILABLE. Hello! 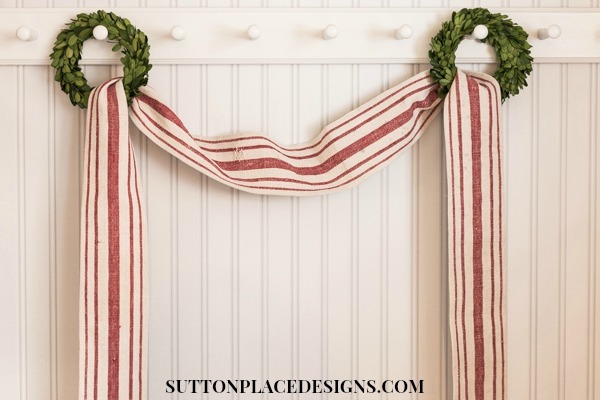 I wanted to pop in today and let you all know that the first batch of Christmas items are available at Sutton Place Designs. I am hoping to have more things listed in the next few weeks. 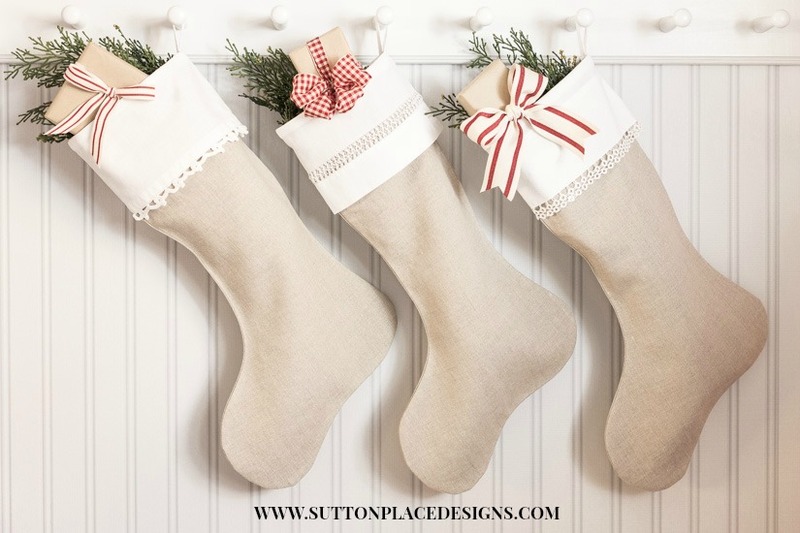 For now I have Christmas stockings, mini grain sack stocking sets and some handmade ornaments. 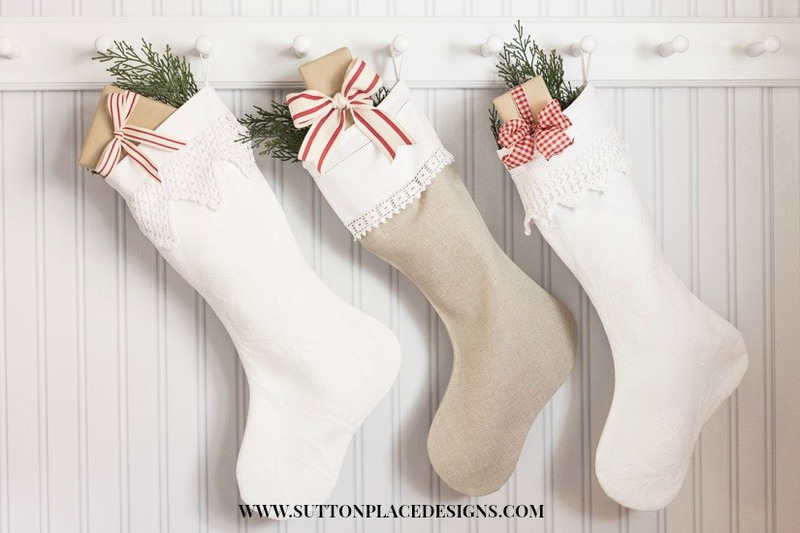 All the stockings are lined and have a sturdy twill hanger. 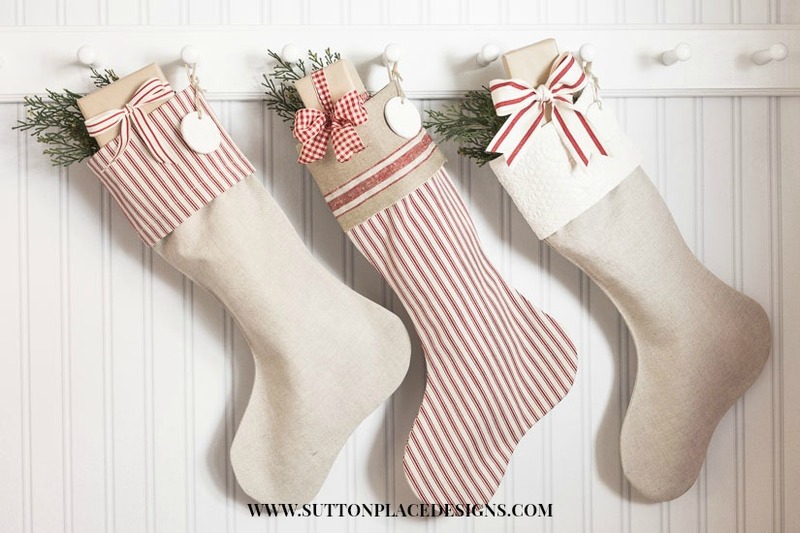 The ticking is from Pottery Barn and compliments the flax linen so most of the stockings are mix and match. These linen stockings are cuffed with the ends of vintage pillow cases. They coordinate nicely with the white matelasse below. The white matelasse is from a large vintage coverlet I found at my antique mall. The ends were tattered and it had a few holes but I was able to repurpose it into these stockings. I had a hard time photographing the white stockings. I could not for the life of me get the texture to show. Below is a slightly better picture of the matelasse. 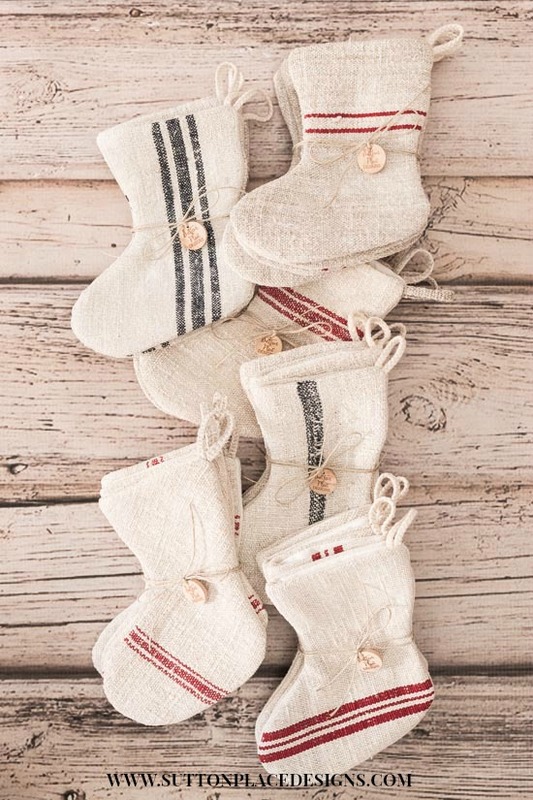 The mini grain sack stocking sets are going fast so please don’t wait if you want one! 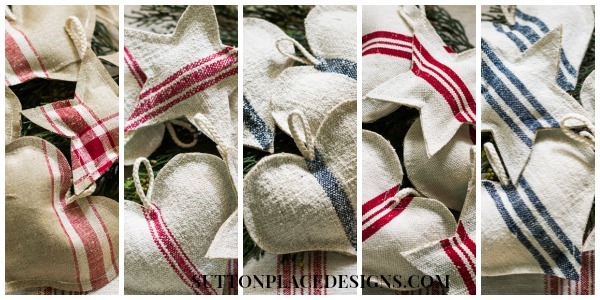 Rounding out this batch of listings are handmade ornaments and a few lengths of grain sack ribbon. Your products are always top-notch! I look forward to receiving my latest purchase and will be watching for more pillow covers listed. Thanks, Ann. Lovely, Ann, can’t wait to see what else you dream up! I love them all, Ann! 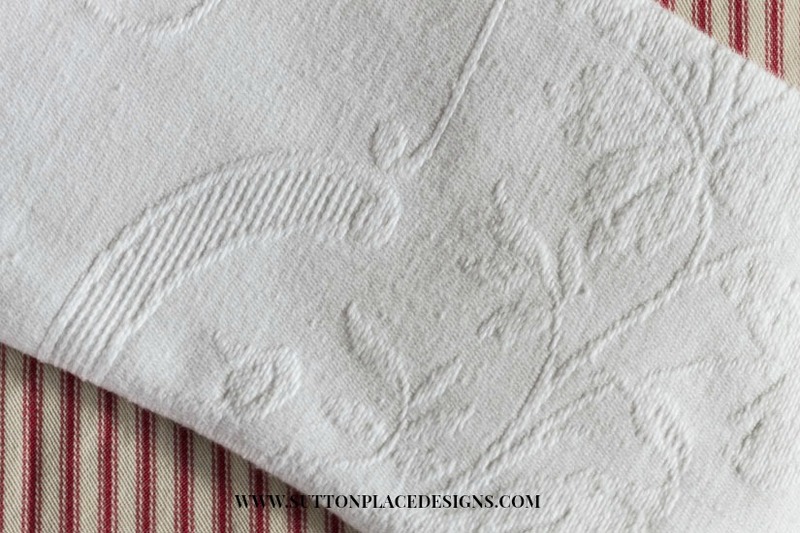 I hope you’ll share these at the Vintage Inspiration Party this Wednesday – I’d love to feature them! Everything is always so lovely. I purchased a couple of Christmas stocking last year and cannot wait to hang them by the fireplace next month. Ladies if you have not purchased anything from Ann’s shop, you should, you will not be sorry, promise! Yay – Christmas goodies from Ann! I love your pretty grain sack items, especially the little stockings. But, alas, I was too late – hoping you will offer more. I have pinned your pictures – your photo layouts are always so inspiring and give me ideas on how I can incorporate them into our home. Thank you!! Just want to say,Love all of your Christmas” designs,especially the small booties, since I have a grandson now, born in July, my first I might add. You are SO incredibly talented. I bow. ps. I forgot to say I LOVE all your things, Ann. They are fresh and crisp but still “homespun” looking! Oh, Ann, you make me want to break out the Christmas tree and start singing Christmas carols! :-) I love the color palette you’ve used and the fresh, crisp, classic look you’ve created. Beautiful work! Beautiful pieces Ann! We have a cold, windy day in NJ so it’s nice to cuddle up with my tea and look at Christmas things! Enjoy your Sunday!